I rarely make special cakes with icing or frosting. I am too lazy. I like the easy way: sprinkle with powdered sugar and move on. Butter is another thing I don't like. Yes, I love to eat it, but no, I don't like to wait for it to come to room temperature and mix it into cakes, because I use a wooden spoon, not a mixer. Old school. 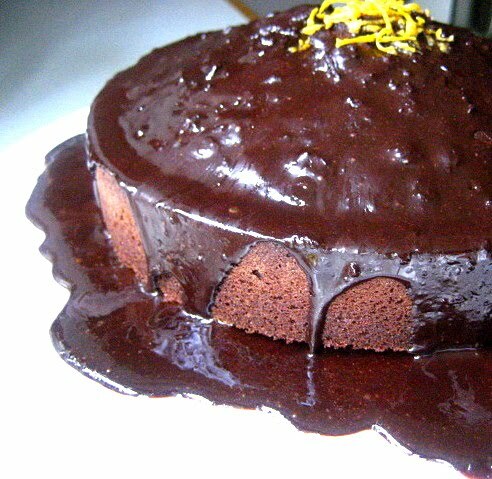 I searched the Wonderful World Wide Web (wwww) and found this interesting recipe for Mediterranean Chocolate cake with Lemon & Olive Oil. I found this recipe on One Perfect Bite, and Mary said "I hope you are willing to experiment and give it a try, you won't be disappointed". I was intrigued. I love weird cakes. Citrus and chocolate are a perfect combination, and I can use my beloved olive oil instead of butter. Another thing I liked about this recipe is that the glaze was a cinch to make. Just pour it out of the pan and it makes its own drippy goodness. This was a delicious, moist cake and made a nice presentation. I made it for a Sunday BBQ and everyone raved. It was not too sweet, and the lemon zest was perfect with the chocolate. I too, hope you will give it a try. 1) Preheat the oven to 350 degrees F. Grease a 9-inch springform pan and set aside. 2) Combine flour, cocoa, baking soda and cinnamon in a medium-sized bowl. 3) Place eggs and salt in a large bowl. Whisk to combine. Gradually whisk in sugar and lemon zest. 4) Sift flour mixture into egg mixture. Fold in until the mixture is smooth. 5) Gradually fold in olive oil. When mixture is smooth, fold into prepared pan. 6) Bake in center of oven for 40 to 45 minutes, or until cake tester inserted into center of cake comes out clean. 7) Cool on a rack for 10 minutes. 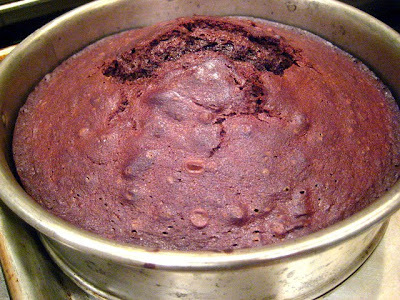 Remove cake from pan and continue to cool on a rack. 8) For glaze, combine confectioners' sugar and water in a small saucepan and stir until smooth. 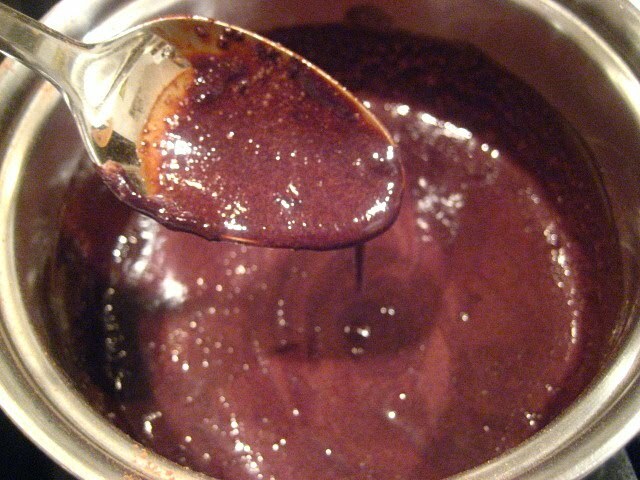 9) Mix cocoa and salt in a small bowl. Stir into sugar mixture and blend well. Add olive oil and stir until combined. 10) Place pan over medium heat and cook, stirring, until mixture is just warm. Add 1 to 2 teaspoons water to thin mixture to glaze consistency. 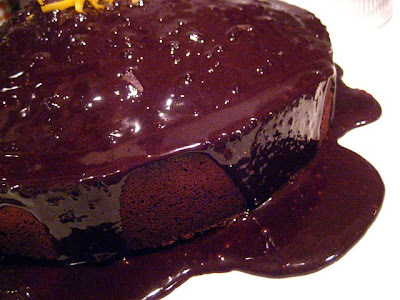 11) Drizzle glaze over top of cake. Let stand for 10 minutes before slicing. Yield: 8 to 10 slices. Decorate the top with sliced almonds, lemon peel or pansies dipped in sugar. I made it the night before and stored it in the fridge to harden the icing. I served it at room temperature and it was moist and DELICIOUS! what a great take on a slightly different cake. I bet it had great texture. Just amazing...with a capital ZING! (sorry, feeling weird today). Looks seriously delicious and naughty, my favorite combo. Love the outdoor photo too. I think I am going to have to make this, it look incredible. Looks like a winner with all that chocolatey-drippy frosting. I'd be swiping my fingers along that dish all day. I think you are truly unique, you don't like butter, and you don't like to use mixer to make cake. Once again you manage to temp me with your cake, even with no butter (I like butter). And you say your not a baker? I hardly ever bake but I think that I am going to have to try this cake. Oh my!